it's time to steal away"
Early on the morning of the 12th December 2002, seven brave souls ventured to the meeting place (my house - as I am a non-driver and a shameless moocher of rides, everyone knows how to get there by now) and set off after a delayed start (someone *coughenochcough* was late), with all our luggage squashed into Ian's and Noch's cars. Five minutes later, we stopped in at the nearest petrol station so people could stock up on supplies (water and snacks) for the long driving journey ahead. On the way down, Steph and Joyce rode with Noch, while Dan, Gail and I were in Ian's car. Gail and I knew we were expected to participate in a full rendition of Les Mis; however, we were unprepared for Dan and Ian's, um let's call it dedication, and we may have gawked when handed a full printed libretto each of the musical. They already knew all the words. The journey down was mostly uneventful (in a good way!). We, six virtual strangers and Gail, dropped in on a friend of Gail's from uni who lived down in Berry and were very kindly invited in for morning tea. It was quite funny to see us walking down Berry's main street, all tourist-like; Dan asked Bon excitedly if there was a General Store (because all country towns gotta have one, right?) and indeed there was, right next to the Chinese Restaurant, creatively named (oh this kills me) A Berry Happy Place. And just before lunchtime, we pulled in at the very large Woolworths in Nowra to do our grocery shopping, supposedly for the week. The boys were sent to wander the aisles to amuse themselves so the girls could do the shopping in peace. This may have been a mistake, for we underestimated the boys' capacity for eating (meat), and overestimated their lack of neanderthal tendencies. More on this later. We arrived at the house just after 1, I think, and we weren't sure what to expect, as Noch had booked the place over the net, and so we pulled into the dirt driveway of 15 Pine St, Bendalong (our car had actually completed Les Mis, and while Dan napped the three of us continued on with Chess). The area was full of caravan park type homes, weatherboard houses, and bungalows (such as the pink one opposite us), but the house was actually really cosy despite looking rather weatherbeaten from the outside. 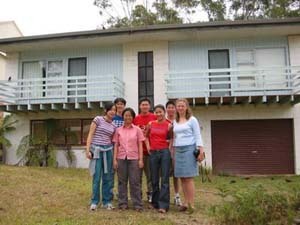 Below is a picture we took on the last day of us outside the house, the one shot with all seven of us as Enoch set the timer on his camera. Yes, we all did frantic hand-waving, and squinted at the red light, to wonder if it was working. The girls shared doubled beds in the nice bedrooms on the upper level, while the guys had a downstairs room with four singles. 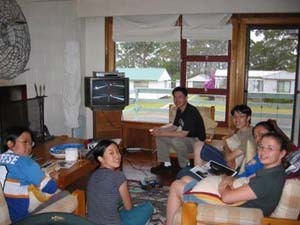 The house was well stocked and supplied - a DVD player, a Nintendo 64 which we plugged into the upstairs TV, some boardgames, and even a small library of books (hah! Once again, my friends' plans to not let me read while on holiday are foiled. I managed to read Donna Tartt's The Secret History in increments over the first three days.) When we first got there, we spent the first moments running around putting away groceries, unpacking and making the place 'ours', all the little acclimatising actions to orient ourselves. You may think that I'm exaggerating, but scarily, I'm not. Three rather placid young men turned into ravenous animals right before our eyes. We bought one packet of ham to make sandwiches for seven, and they asked us in all seriousness if they could use that amount to make one sandwich. They even made us promise that as soon as we would go shopping again and buy more meat ("And this time, think of how much you would buy, and then DOUBLE it."). OK, by now you might be thinking, isn't this supposed to be a BEACH holiday? 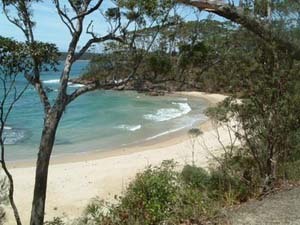 And yes, we were five minutes walk from a breathtaking beach, but we would not see it for the next two days. Why not? Well, the weather was really cold when we got there, it felt rather winterish and grey and it was raining as well. So we spent the first day inside the house, just enjoying each other's company. 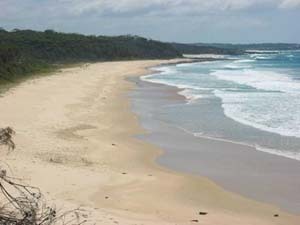 But here are some shots of the beautiful beach that was practically ours for the duration of the trip - while we were down there, we only ever saw three other people venture onto the sand. It was just wonderful. All we had to do was walk down the road, then along a narrow path down the side of the cliff (most of the times while singing hymns we could remember in entirety) straight onto the beach. So what did we do all day instead, cooped up inside the house? Well, for one thing, we drank a copious amount...of tea and coffee. Whenever there was a lull or anyone was feeling cold, an offer to make tea would arise. We also played quite a bit of MarioKart on the N64 (and when I say we, I mean pretty much everyone bar me, after my disastrous 9 minute lap of an incredibly easy course, most of which I spent toddling in the wrong direction and making crazy spins as I ineffectually tried to turn around) in the lounge room, which we continued to do at various times during our stay. It was also the first arena in which a boys v girls "friendly" competition was set up, in which Steph was proved to be a champion, though Daniel was a close runner-up. Anyway, girls 1 boys 0. 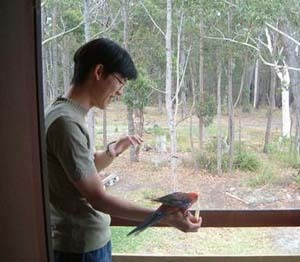 The first day was also special in that we met some of the native fauna that lived around us. 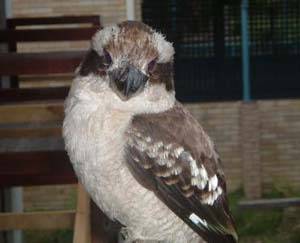 We made special friends with a certain kookaburra we named Kevin, and he and his friends certainly enjoyed eating the fatty rinds of our bacon, which they seemed to think were worms as evidenced by their hearty bashing of the strips on the wooden railings. Violence was not only perpetrated by our animal guests, however. Dan and Ian had a fascination with getting up close and personal with them - even after being warned about how powerful and dangerous a kangaroo's kick can be, Dan boldly walked up to a herd of them right in our backyard area (which included a male and his females and their children) and took a few happy snaps. 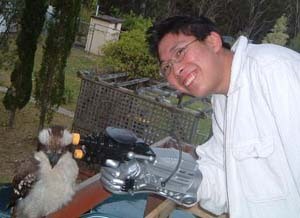 Then, Dan had some fun with a strange toy the guys dubbed the "terminator arm", and posed for some jolly shots with our kookaburras. The rest of the day passed blissfully like this. Steph made us marinated chicken wings for dinner, with salad. The guys agreed it was delicious, but once again complained about the lack of food (salad, according to them, is not food). Some more MarioKart, some TV (Joyce and Steph watched the finale of Smallville, and the rest of us made snarky comments to their annoyance), even more coffee and tea, and then it was time for our first night's sleep away.